McElrath Trailers was established in 1985 and has been committed from the beginning to the highest quality trailers available. The equipment we offer today represents this commitment. The McElrath trailers we build today use everything from the most efficient running gear to the highest quality paint available. We also provide major and minor trailer repair services. 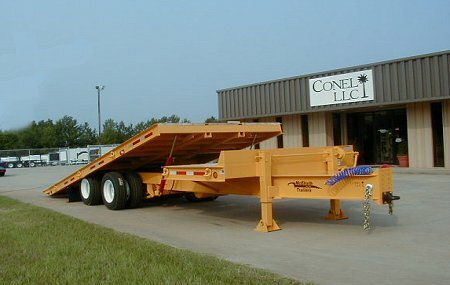 McElrath Trailers manufactures a full line of trailers from Skidd Steer Loader trailers up to 22.5 ton over the road Kingpin trailers. This equipment can be further tailored to your specifications through the addition of any number of available options. McElrath Trailers maintains a full-line parts department to provide service after the sale. Orders are shipped daily to allow for the rapid replacement of damaged, lost, or stolen parts. McElrath Trailers All rights reserved.